Yes, this rock that you see right here is called volcanic rock, which means that it used to be lava until it cooled and hardened into rock. I got it from the top of a volcano. 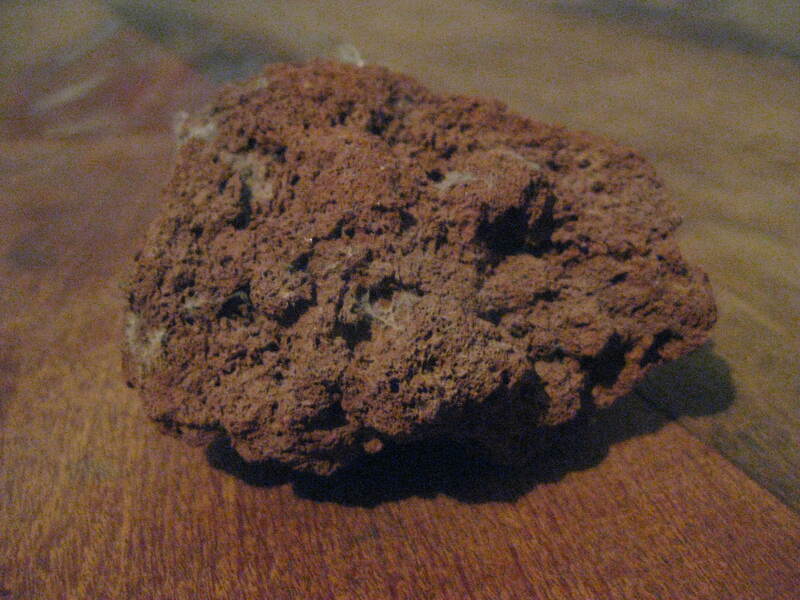 That’s right, your very own Mommy once climbed a volcano (it was asleep at the time) and brought back this rock just for you. Sit up, and I’ll tell you how it (might have) happened. Once, a long time ago, before any of you were born, your Papi and I took a trip up into the mountains. The little town where we stayed was right next to a lake, with tall, tall mountain peaks on every side. In the town was a little old man, and it was he who told us about the volcano. He took us right out into the street and pointed up at one of those mountains. It wasn’t as tall as some, and it’s top was a bit rounded. He said that was because it was a volcano. It had been asleep for years, but it was a real live volcano, with lava at its heart and lava rocks on its top. Some people climb it, he said. I knew right then and there that I had to be one of those people. The day we set out to climb the volcano was a lovely sunny day. The trees at the bottom were beautiful and swishing a bit in a nice breeze. The trail wound away up the hill just like any other trail. We started off with high hopes of being at the top in time to eat lunch. We would have made it with time to spare if that darn volcano had just stayed asleep. We kept on hiking, feeling our legs get tired as we went, and every once in a while feeling just a tiny little trembling of the ground. It happened often enough that both Papi and I noticed and asked each other what it could be. We should have been smart and turned around right then, but we wanted to see the top and to be able to say that we stood on top of a real volcano. We kept climbing. We were just getting to the part where there were no more trees and only rocks ahead when the ground started shaking for real. It shook so hard that we both fell over and just sat there, holding onto the bushes that grew by the side of the trail. When the shaking finally stopped, we looked at each other. We were both thinking the same thing. That volcano was not sleeping. That would have been another good time to head back down the mountain. But we were SO CLOSE to the top. We thought we would just run up really quick and look around, and then get back down in plenty of time. The first part worked perfectly. We were at the top in five minutes. The view was spectacular. We didn’t have time to admire it, though, because right at the moment the mountain gave a tremendous lurch, and ground cracked open right by our feet. The crack spread quickly and before we knew it, we were separated by a glowing chasm. I did not at all like being on the opposite side of that opening from Papi, so before I could think I leaped across. I could feel the heat rising up from the depths as I jumped over. Papi and I turned to run, but the ground was shaking and the rocks rose up into the air under our feet. A fountain of lava burst up out of the ground not far from us. There was no way to get down quickly enough. Lava was bubbling up out of the crack and already moving toward our high rocky perch. Only a little way down the mountain, I saw two old twisted trees. I knew they were our only hope. Jumping down off the rock, we made a leap across the growing river of lava. I almost didn’t make it. As I landed on the other side, I slipped and grabbed hold of some rocks to steady myself. This piece of rock came off in my hand, and without thinking I stuffed it into my pocket. Then we dashed for the trees. We each climbed a tree and prayed that the lava would go around. We were not so lucky. The stream of lava came straight for our trees, slow and steady as lava always moves. We knew it would burn up the trees if it hit them. Then another great explosion rocked the mountain. The trees fell with a crash. We barely managed to avoid being crushed, as we each scrambled to the top of the branches that were now skidding down the mountainside. Clinging on as tight as we could, we rode those fallen trees all the way down the mountain. The river of lava was right behind us, but we were moving faster. When the trees finally crashed to a stop in the foothills, we jumped off and ran as hard as we could. Rescue vehicles were not far away, including a helicopter which flew us a safe distance away. Then we stood with the rest of the town and watched the mountain bubble.